An accurate understanding of power utilization and environmental conditions is essential to ensuring high availability and improving energy efficiency. 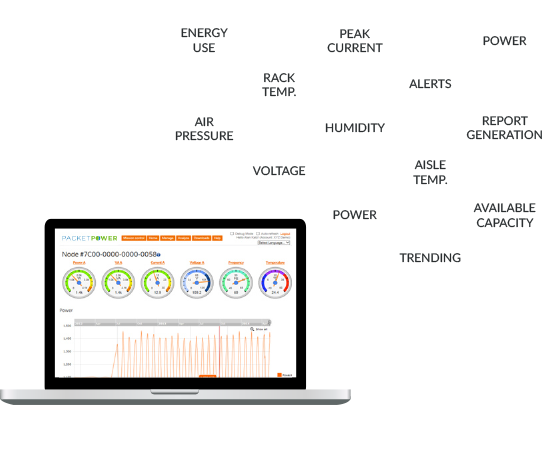 Packet Power offers a full range of power and environmental monitoring hardware and software that can provide the insights you need. Know exactly how much energy a circuit is drawing prior to adding additional load. Know where you have both underutilized circuits and adequate cooling to remove the heat created by increased power use in that location. Easily access historical data, including minimums and maximums, to understand changes in energy usage across time. View a real­time facility heat map to identify hot cabinets and track temperature in real time. Tailor your monitoring to gather more data where heat is an issue and less where it is not. Instantly see the impact of air handling changes. Get real­time alerts via email, SMS or private Twitter feed. Our unique “policies” feature allows alert criteria based on power or environmental conditions to be defined once and applied to cabinets across an entire room. Track the performance of your facility across time and accurately understand the impact of both energy efficiency initiatives and changes in demand. Manage load thresholds based on circuit­-pair totals within a cabinet, eliminating unnecessary alerts in cabinets with uneven A/B loads. From cabinet­-level load to RPPs and MPPs, ensure that power usage is distributed well across phases. Spot cabinets that have unusually uneven load on A and B feeds to proactively determine if a power supply may have failed. Data from monitoring units can be used to demonstrate compliance with service level agreements based on meeting high­- and low­-temperature limits and power availability. Implementing monitoring doesn’t need to be costly and complex. We make it easy to start small and will provide useful information within hours of installation. to monitor what you manage.